Raspberry Cheesecake is definitely one of my favorite desserts, it’s simply divine. The berry and cream cheese combination is amazing. I also love truffles, so I’ve decided to combine the two. These truffles are purely decadent! 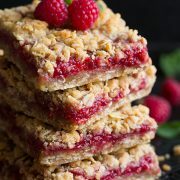 They are bursting with that unmistakable raspberry flavor, both from the raspberry jam and raspberry extract. These truffles can be made without the raspberry extract if you’d prefer not to purchase it, just note the raspberry flavor won’t be as strong. These truffles are equally amazing covered in white chocolate as they are covered in milk chocolate, so take your pick. Be sure to store you truffles in the refrigerator. It may seem strange to have chilled truffles but it’s just like cheesecake, it’s always chilled. I even love these frozen too, so if you don’t finish them off in the first day or two just throw them in the freezer and enjoy them for weeks. 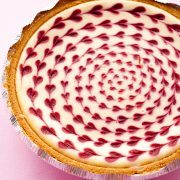 You may also like to try my White Chocolate Raspberry Cheesecake or White Chocolate Blueberry Cheesecake. The perfect homemade treat! 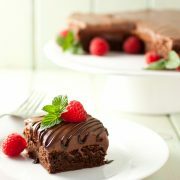 A bright raspberry cream filling surrounded by a layer of rich chocolate. In a mixing bowl, using a fork, mix together cream cheese, 14 ground graham cracker sheets, raspberry jam, and powdered sugar. Stir into well combine. Mix in 1/4 cup melted white chocolate chips, raspberry extract and food coloring. Blend well. Cover mixture with plastic wrap and freeze 1 hour, or until firm enough to form mixture into balls. Remove mixture from freezer and scoop mixture out by tablespoons and form into balls. Place on a wax or parchment covered baking dish or plate. 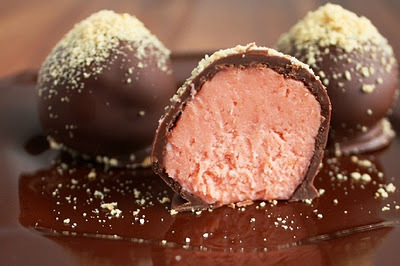 Cover truffle balls with plastic wrap and freeze 1 hour, or until firm enough to dip in chocolate. Melt chocolate chips with shortening in microwave on 50% power in 30 second intervals stirring after each interval until melted and smooth (if using white chocolate I would do shorter intervals as white chocolate is more temperamental). Remove truffles from freezer, using a toothpick or fork, dip truffle balls into melted chocolate. 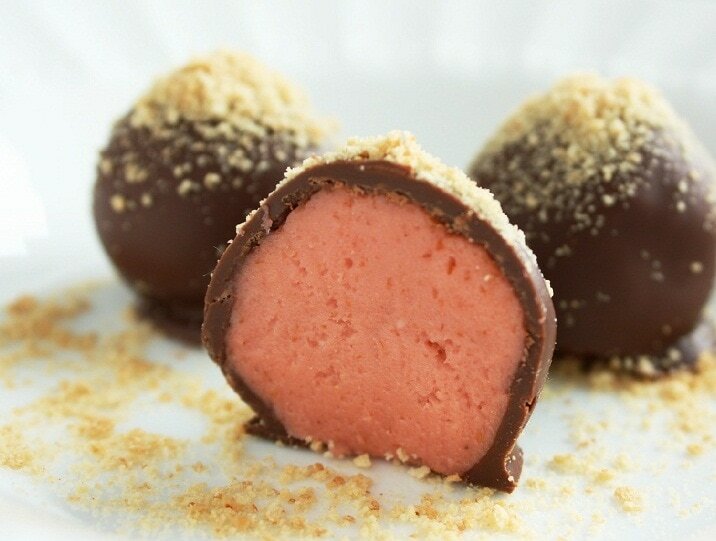 Return chocolate covered truffle to wax paper and sprinkle with ground graham cracker before chocolate hardens. Repeat process with remaining truffle balls. Place truffles in refrigerator and allow chocolate to harden. Store truffles in refrigerator in an airtight container. Tiffany: Do you know where I can find raspberry extract? I live in Canada and apparently it’s really hard to find here! Any substitutes for this?